The moon, accompanied by her bright friend Venus, shone brightly over the Amalfi Coast a few nights ago. Along the moonlit and silent coastline, the ruins of the once magnificent Basilica di Sant’Eustachio tucked up high in the mountains about Amalfi were aglow. A magical night in Scala was about to begin. As I scurried down the steps to the ruins, I heard something familiar being recited. It was an excerpt of Homer’s Odyssey telling of the brave Odysseus and his voyage past the deadly sirens, long thought to have once inhabited the coastline along the Sorrento Penninsula. Thus began an enchanting evening! The event was called Il Viaggio in Italia (The Journey in Italy) featuring solo performances by great Italian singer Lucio Dalla interspersed with readings by Marco Alemanno of writings by travelers to Italy. It was held at the ruins of the Basilica di Sant’Eustachio in Scala, which I’ve written about here on Ciao Amalfi. I couldn’t think of a more evocative setting on such a beautiful night on the Amalfi Coast. After squirming uncomfortably in the pews that had been carried down the steps and placed in the church (now I know why the church that got ride of them did so), we got up and started exploring the ruins. Seeing them inside for the first time on a moonlit night with the music and recitations in the background was truly magical! And for those fans of Lucio Dalla, here is a video of him singing one of my favorite songs called Caruso. I apologize that the video is cut off, but I have a strange problem with my camera that prevents me from making videos much longer than two minutes (or they will be stuck forever on my camera). If you want to hear the entire song, here is a moving video of Lucio Dalla performing Caruso at Naples’ San Paolo stadium. This concert was the opening event for a conference taking place in Scala today and tomorrow called Grand Tour: Viaggio in Italia. In an area of Italy famous for its many visitors today, it seems quite appropriate to go back to the origins of today’s tourism, the Grand Tour, which brought so many visitors from across Europe to Italy in the 17th and 18th centuries. While these original tourists brought canvases and sketchbooks rather than the digital cameras of today, they marked the trail down to Naples, further south to Calabria and onward to Sicily. These were the tourists who wrote home telling of the beauty of southern Italy, its impressive historic sites, its people, culture and traditions, and who knew they had found a place at once remarkable and unforgettable. Avanti viaggiatori! Onward travelers! As I spend my first whole month of August on the Amalfi Coast, I am learning a lot of new things. The first is that I finally know what really crowded here really means. And I mean the really crowded, no place to park, no beach chair left unoccupied, mobs of Italian tourists sort of crowded. It ain’t pretty, and let’s just leave it at that. The up side is that I am seeing so many festivals and events for the first time, which has been a great deal of fun. 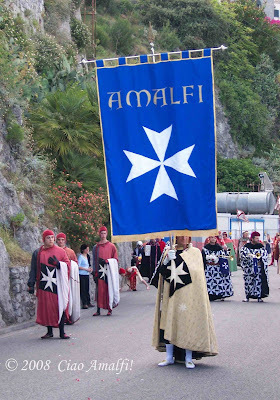 Tonight is the festival for San Lorenzo, that patron of the city of Scala on the Amalfi Coast. Most of the year a quiet and sleepy little town, you will be hearing more about Scala over the coming month as I write about the Scala Meets New York festival starting tomorrow. The town is all set up for the festivities, which started yesterday evening. I am looking forward to seeing the procession, hearing the music by a band from Lecce, and seeing the fireworks display over the city for the first time. I just read a fun article online at Italy Magazine about the night of San Lorenzo that I had to share here. I didn’t know before that tonight is a night for wishing on falling stars, called the “tears of San Lorenzo,” that come from the Perseidi meteor shower. You can also head over to Bleeding Espresso where Michelle wrote a lovely post last August 10th about the La notte di San Lorenzo. All across Italy, people will be outdoors looking for falling stars and making wishes. Speaking for this hopeless romantic, you can bet I will be in Scala with eyes searching the dark night sky for shooting stars ready to make my wish! Walking through Amalfi the other day, I noticed this strange little sign advertising a mostra d’arte, an art show. Fortunately, I had a few moments to enjoy walking through this colorful and fun little exhibit of work by the artist Giuseppe Palermo, or Pepe, presented by the Presso Azienda Soggiorno e Turismo of Amalfi. I am not sure if art exhibits happen here every summer, but this is the first I have seen. I hope there will be more! The beautiful courtyard is a perfect location, and one that is often just passed by. This show was called “Famiglia Gialla,” or “The Yellow Family,” and all of the paintings and sculptures featured one or more of these little yellow figures. Each of the figures had a definite sense of “melancholy happiness,” as Pepe describes it, which was evident as I walked around the courtyard both wanting to laugh and to frown. It was a strange combination of emotions! Hiding out from the pouring rain in Amalfi, I watched the Regata Storica delle Repubbliche Marinare on a TV in the crowded Gran Caffè yesterday afternoon. Pisa started out strong and stayed in the lead to win the race. Although word on the street wasn’t the best for the Amalfi team, my boyfriend said that Pisa waters are lucky for Amalfi. It’s true! They ran a good race in second the entire time, and stayed there with a photo finish with Genoa who took third. Rather unexpectedly, the Venice team, who usually win each year, came in last. I’m not sure if the Amalfitans in the bar were more excited that Amalfi came second or Venice came last. I am happy for the Amalfi team to get second! Great work guys!! Go Amalfi! !